Happy Monday, y'all! I have this weeks Zakka 2.0 to share and all the details for mine. 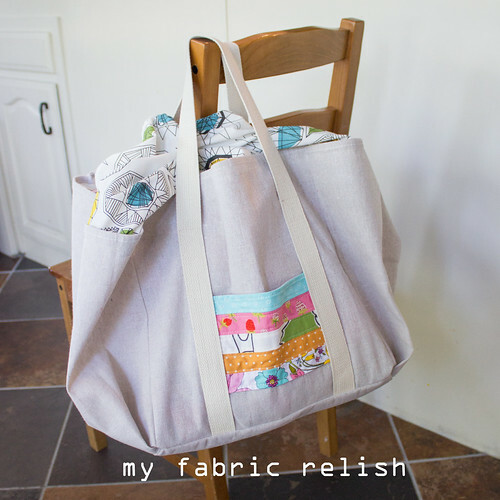 This week's assignment was to make the Piece of Cake shopping tote and as someone that uses reusable totes at the store, I knew this one was a keeper. I did mine a tad bit different than the books states. First, I put a pocket on each side because the first pocket I made was crooked so I made a second one. I was happy with the second one, but then decided that I should just put both on there and take pictures of the better side. hahaha! Second, I used a drop cloth from Home Depot for the bag part. The drop cloth was in the painting section and I inadvertently got the one with the plastic lining on the underside. Oops! 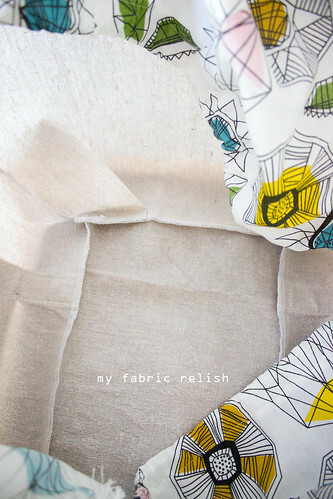 Well, it worked out better for this project because it provides the same waterproof layer inside and I didn't have to use expensive oilcloth or any of my good fabrics. It was also pre-hemmed...score! I just cut my pieces to make sure the hems were where I needed them and it sewed just fine on my machine. I did switch to a denim needle just in case. Lastly, I used my serger to finish the insides so it didn't fray or unravel. My drawstring fabric is from Ikea and was only $5 a yard. 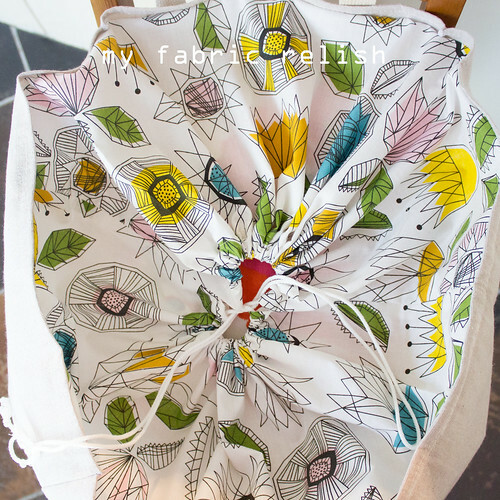 I also serged that so it was quick to sew into the bag and hem for the drawstrings. 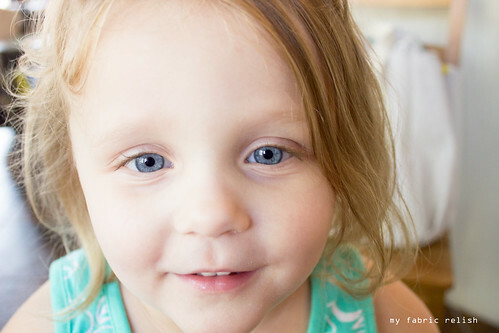 And as usual big relish style, she did a stellar photo bomb of the photo shoot! This tote looks awesome! I am going to have to buy this book. Aww, thank you Yvonne! Oh, you really should get this book! I have enjoyed the sew-a-long so much. Thanks for visiting and taking time to leave a comment! Great idea-to use a drop cloth from Home depot! That looks great!! Thanks, Debbie! Who knew I would go fabric shopping at Home Depot!? Ha! oh wow - aren't you clever?? 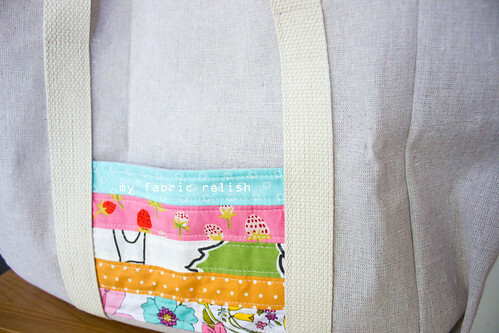 Your bag looks terrific and will be super useful! Thank you! I really hate doing hems so I totally scored on this idea! 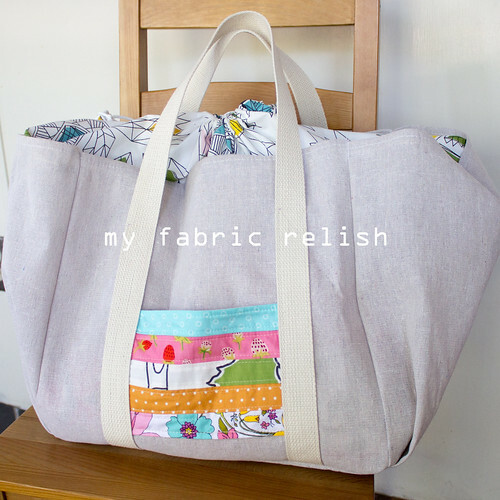 I also don't feel too guilty using my good fabrics because I know it will get dirty lugging groceries in it. Thanks for visiting and leaving such a sweet comment! Omg I totally love this bag....and the photo bomb by relish #1...I want one!! Love it. I was wondering what fabric that was:) Total score...lined AND hemmed! It has a great linen look to it. Haha...score is right! It is a tad bit scratchy but ill be more likely to use it knowing it's not my fancy linen. Lol. Love your practical use of fabrics... with such style!! This looks great! And I so appreciate your telling us that your pocket wasn't perfect! You put things together in such a beautiful way!